In the early nineteenth century, the British Navy ruled the waves. Napoleon may have have been the master of continental Europe, but he didn't do nearly so well on the high seas. Under Admiral Nelson, the British reigned supreme, but there was a problem. The British fleet couldn't be everywhere at the same time without spreading themselves too thin. They just didn't have enough ships. 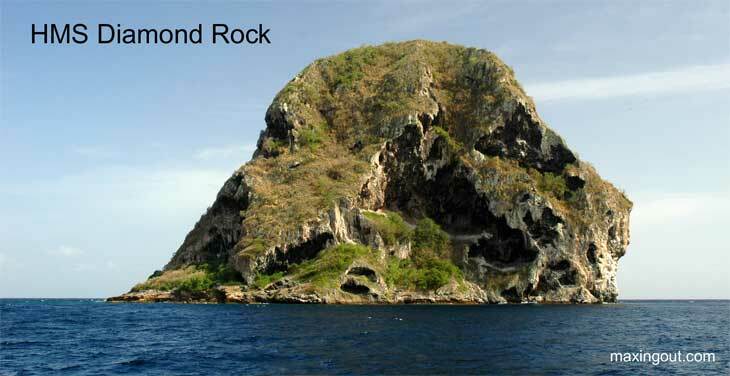 In 1804, the British Admiralty placed 120 sailors with canons and all their gear on Diamond Rock, a small island located three kilometers off the southern coast of Martinique. This Island was crewed by the British Navy, and designated as a fighting ship, the unsinkable HMS Diamond Rock. For seventeen months, the Diamond Rock fired its canons at any French shipping that foolishly wandered within range. The steep sides of this inhospitable volcanic rock made it easy to defend and difficult to conquer. The British occupied the rock for a year and a half before the French navy evicted them. Log 39 When Are You Coming Home? This web site is a companion to Outback and Beyond.com.